Zoomorphix Systems is the developer of ExamStudio Online®, ExamStudio Web Delivery®, Glass3D® and Red Panda X®. We provide services to the testing community, with established clients across a broad range of professional accreditation, licensure, certification and educational organizations. Zoomorphix Systems' primary client base includes leading testing organzations across the U.S.A with programs that range from regional to international in scope. Our mission is to provide industry-leading, state-of-the-art testing solutions which allow our clients to continuously expand their ability to train & assess effectively. 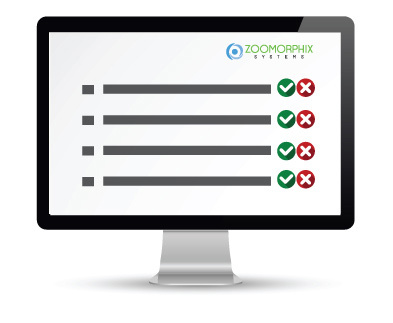 We have been working toward this goal since the establishment of Zoomorphix Systems in 1998. The Zoomorphix Systems software development team has an enviable depth of talent and expertise, having successfully and consistently delivered enterprise software solutions. Support for all software products is provided by staff members who are passionate in their commitment to client service. Zoomorphix Systems has a history of working on large, global projects. The company prides itself on its excellent record of delivering highly reliable, leading edge solutions. Zoomorphix Systems has a very powerful item banking, test publishing and web delivery system. We pride ourselves on providing deliverables on time and within budget. We also provide additional custom software services to further enhance ExamStudio to meet your needs. We deliver a world class product.